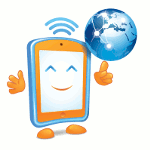 Safer Internet Day is an annual observance organized by the Insafe network each February. It is dedicated to raising awareness of emerging online issues, from social networking to cyberbullying, and making Internet a safer place for kids and young people across the world. Safer Internet Day was founded in 2004 as an initiative of the European Union SafeBorder project. The next year, the Insafe network took over the organization. Originally a European observance, Safer Internet Day is celebrated across all populated continents, in over 100 countries. It promotes more responsible use of Internet and gadgets by children and young people who are growing up in a digital environment. Technology has become an integral part of our lives, but a lot of people are unaware of the challenges and opportunities online. That's why Safer Internet Day is so important. It aims to educate people of all ages across the world about Internet through events at schools and colleges, conferences, press conferences, and other events. On this day, industry professionals gather to exchange their ideas on what a safer and better online world is and how to create it. There are a lot of ways to celebrate Safer Internet Day. You can get involved in internet safety debates, create and promote positive content, report illegal and harmful content, teach children digital literacy skill, etc.